The first leg of the 2018/19 Vaucluse Challenge took place last Saturday. A beautiful day and a challenging and shifty 7 – 12 knot SE breeze greeted the DBSC and VYC sailors who competed on a great course set in the neutral waters off Rose Bay. It was a great day of sailing with the usual competitive spirit and friendly rivalry between the clubs. After an hour of scrutineering by the two club Commodores, the results were finally settled. They proved that the new, highly complex scoring system is making the Challenge more competitive this year. 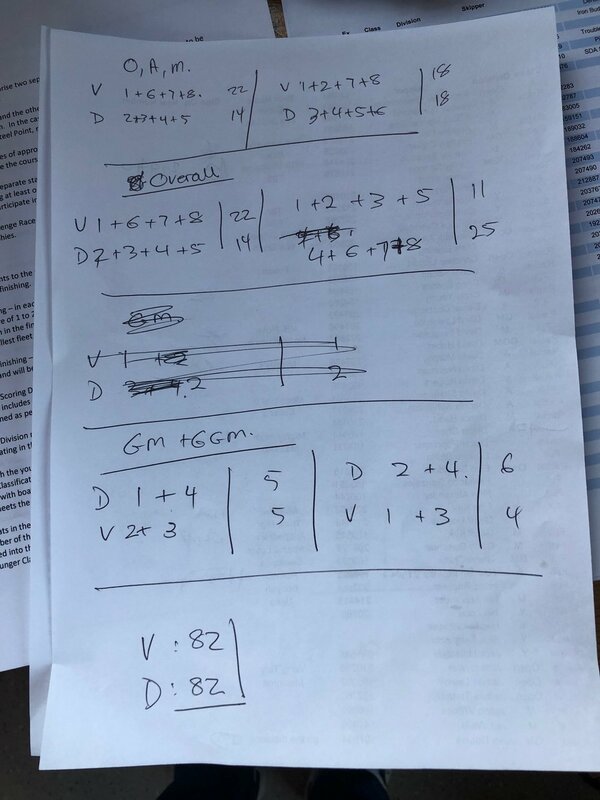 In fact, in the standards, the clubs were tied with 82 points each – DBSC won convincingly in the first race (33 vs 49 points), but lost equally badly in the second, primarily due to Vaucluse having positions 1, 2, 3 and 5 out of the top 8 finishers overall. In the radials, DBSC won convincingly with 45 points to VYC’s 79, beating VYC both overall and in every age division but one. This gave DBSC an overall win in the first leg of the challenge – 127 vs 161 points. After the competition on the harbour, DBSC welcomed a sizable contingent of sailors from Vaucluse to a BBQ on our deck. The meal was delicious, however the culinary crew pointed out that several DBSC members started to eat before our guest from VYC had arrived. They have asked everyone to please refrain from doing so in the future. Thanks to VYC for a well-run and enjoyable day of sailing and to Andrea, Shirley, Peter and Pat for a great meal. Thanks also to Jerry, Dene and Clare for their support on the water. The working out of the results. Proof that 2 Commodores are better than a computer.